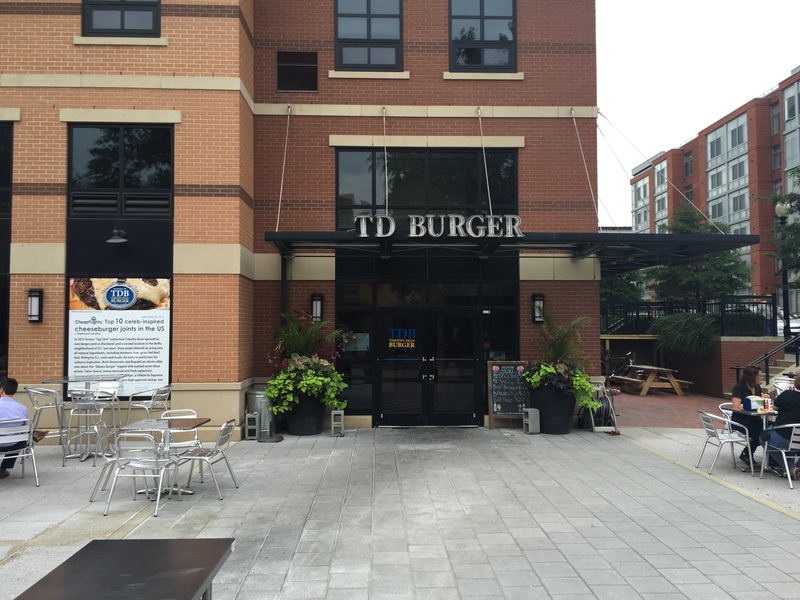 We really want to like TD Burger (250 K Street, NE). It has a great location right across the street from the always popular Indigo and who doesn’t like a good burger place with an awesome patio? Sadly our previous experiences at TD had taught us to avoid the place. However, recently the restaurant has set up a smoker on its patio that wafts delicious hickory BBQ smells for multiple blocks. After attempting to avoid the temptation multiple times, we finally gave in and gave TD Burger another shot. Unfortunately, we should not have. Let’s start with the logistics of takeout: an unnecessary nightmare. 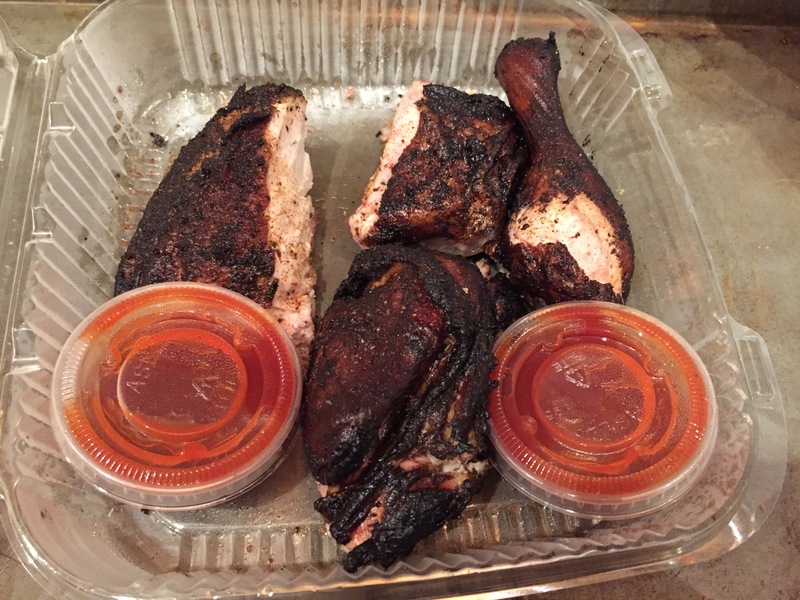 You order the BBQ inside and then pick it up from the guy at the smoker outside. Makes sense but wait: there are only certain BBQ items that you pick up from the guy outside–for other random ones, you pick them up inside. For example, we ordered a half BBQ chicken and an order of brisket. The chicken comes from outside, the brisket from inside. It didn’t make any sense, but we went with it. We placed our order and then went outside to pick up the chicken. TD Burger was not busy at this time. There was one guy in front of me also waiting for chicken. It took about ten minutes for him to get his chicken (even though it was already done in the smoker), and then it was our turn. The chef manning the smoker told us to wait a minute and then he would be right with us. He disappeared inside for five minutes or so and reemerged with a tray of raw pork ribs. He proceeded to marinate the various racks of ribs and threw them in the smoker while we waited. He then washed his hands in a bucket full of dirty water (no soap) and then proceeded to grab our chicken out of the smoker. Using his bare hands (which he had 30 seconds ago been marinating the raw pork ribs with) and tongs that he had also “washed” in the dirty water he divided my (measly) half chicken into thirds and cut it up. When we asked about having BBQ sauce on the side, it was interpreted as an odd request. The whole process took at least 20 minutes, despite the fact that the chicken was done and ready to go the second we walked outside. We walked back inside to pick up the brisket that was surely done by this point. Wrong. Took another 5-10 minutes for that to come out as well. Now to the food itself. The chicken was fine but relatively tasteless. We applied some of TD’s BBQ sauce to it to help moisten it (the extra 20 minutes on the smoker did it no favors). The BBQ sauce basically tasted like a watery ketchup with no real hints of BBQ in it. We then moved on to the brisket to see if it could save the situation. On the menu, it just says “brisket,” no real explanation of what that might be (platter, sandwich, etc). 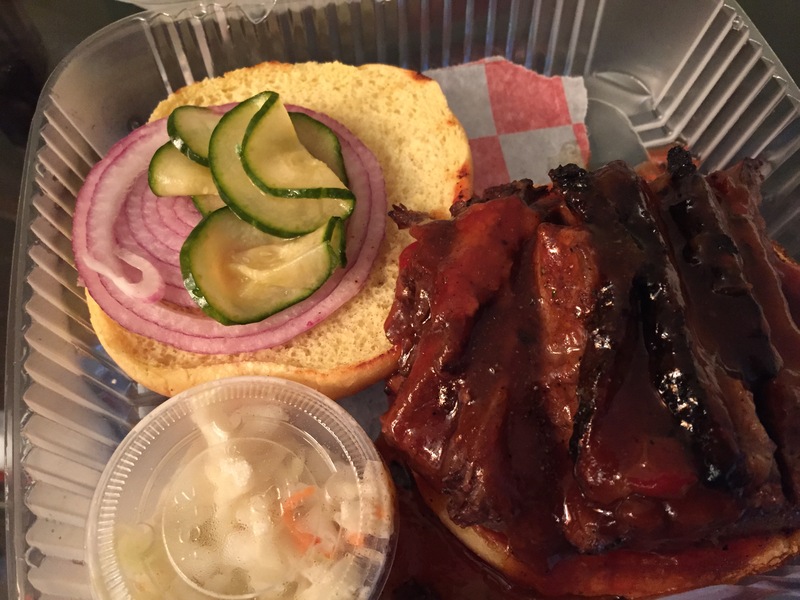 Turns out it is a brisket sandwich, which was completely fine by us. Alas, the brisket on the sandwich had been doused in TD Burger’s ketchup sauce prior to being packaged. The bun–a standard hamburger bun–had been destroyed in our short walk home. Interestingly enough the sandwich also had pickles (fairly normal) and red onion (bizarre) on it as well. We couldn’t get an honest read on the flavor of the brisket by itself because so much BBQ sauce had been applied already. Regardless, the whole sandwich was not something that we will rush back to try again. Every time we have walked by TD Burger’s patio since this experience, the wonderful smell of hickory smoke beckons us towards TD Burger’s BBQ again. Then we remember our experience, think better of it, and brave the long line at Indigo. Thank you so much for this review. My husband and I learned not to return to this establishment but, like you, the addition of the smoker has made me curious. I’ll try to keep your experience in mind. Thanks for this update. I am shocked they are still open. I did wonder if I should go back after my first bad experience because they were only open a few months at the time. The food is blah and the service is nonexistent. We sat outside and waited forever for someone to come, not realizing that we had to go inside to order food. So, we went in, ordered and waited a long time. We had to go back inside to get the condiments needed for our meal as well as for napkins. Our burger buns were soggy and I can barely remember the burger itself, it was that ordinary. I’m just waiting for the place to close and be replaced with a delicious new spot that can really capitalize on the huge patio space! TD Burger will never close. Best BBQ and Burgers in the city hands down! Best BBQ in the city hands down. The best BBQ in the city hands down. DC smoke house? Are you kidding me. You people would not know good food anyway. Get out of my city Please!